Buoy Salvage and Ethel E.
Bell buoy 11 washed ashore on April 15th and was residing on 8th street ocean beach right around the high tide line. 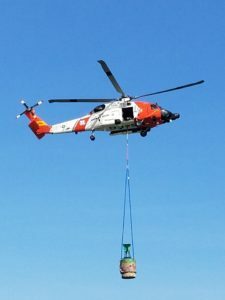 On May 2nd the Coast Guard initiated salvage operations and removed the navigation tool. To check out a video of the salvage operation click HERE. Interesting article HERE in The SandPaper about the 50th anniversary and history of the Ethel E. Jacobson elementary school.